Chunks of ripe peaches and chopped pecans flavor these whole grain waffles. 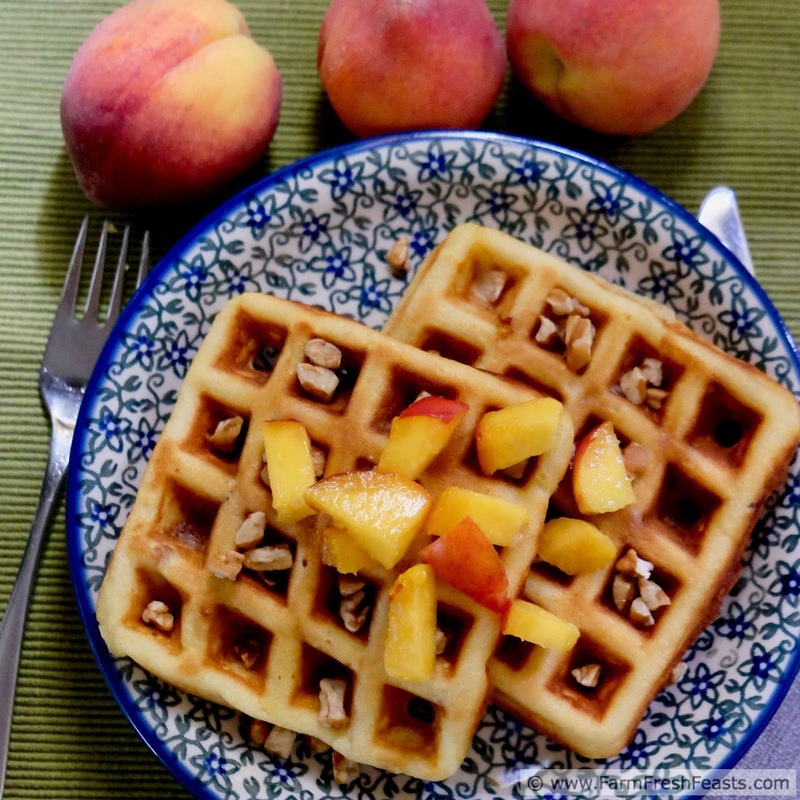 Peach and Pecan waffles are perfect for a summer breakfast or brunch. Celebrate the summer season with my favorite fruit--peaches! As I type this, the peaches on my daughter's tree are plentiful but not yet ripe. However I often work a year ahead, so I'm going to share a recipe from my son's birthday/graduation trip to see Space Things. Last year we passed thru Georgia en route to/from the Space Coast of Florida. I picked up peaches and pecans on the way down, and then more on the way home. We love peaches. Next I heard about The Peach Truck and bought a case of Georgia peaches in a local hardware store parking lot. [Note--I was at work on the day the truck was due and a friend picked up my case for me.. Full disclosure.] The peaches weren't yet ripe, so I bided my time before I could make my Peach Salsa. The peaches started ripening in dibs and dabs. First we were sharing slices of a single ripe fruit, then eating them out of hand, and finally we progressed to having enough peaches ripe at the same time to make something. I followed the advice I'd gotten long ago from a reader who suggested that items grown together taste good together. Think of tomatoes & basil, cucumbers & dill . 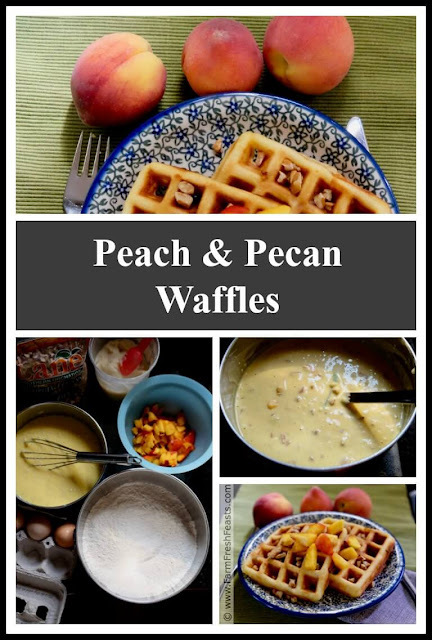 . . and that's how I came up with peaches & pecans. 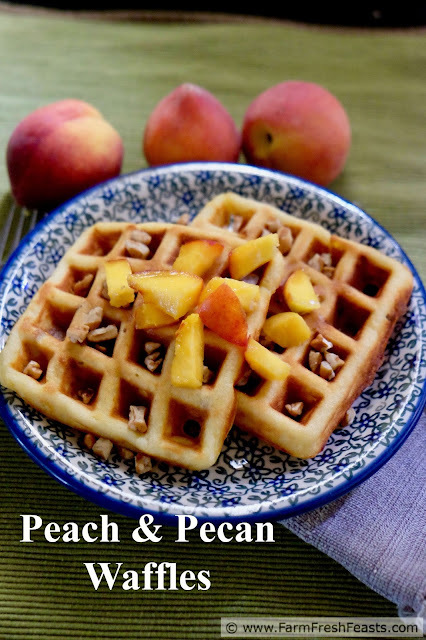 I started with my standard waffle recipe based on a long ago Alton Brown episode (where I paused the show and actually wrote down the ingredients), and substituted peaches for the other produce. 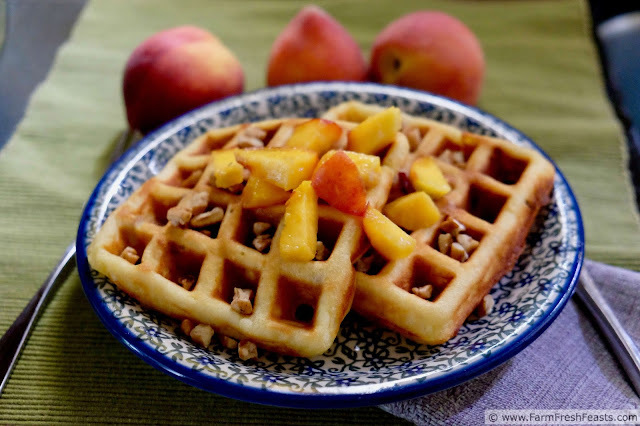 I've previously shared Butternut Squash Waffles, Tangerine Waffles, and Sweet Corn & Blueberry Waffles among other produce-enhanced waffles on this site. 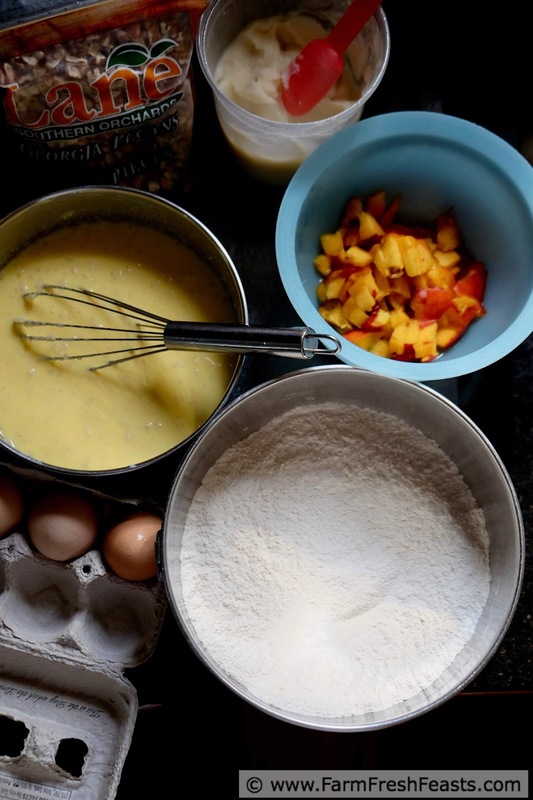 For more recipes using peaches, please see my Peach Recipes Collection. It's part of the Visual Recipe Index by Ingredient, a resource for folks like me eating from the farm share, the farmer's market, the garden, the neighbor's garden, and great deals on ugly produce at the grocery store. In a medium bowl, whisk together bacon grease, eggs, vanilla, and buttermilk. Set aside. Stir buttermilk mixture into flour mixture. 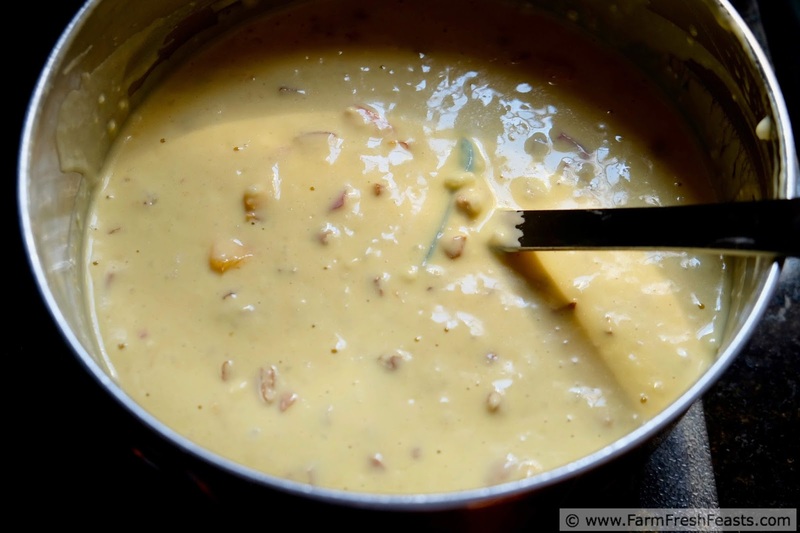 Add in peaches and pecans and stir until combined. Set waffle batter aside for 30 minutes. Once the batter has rested, preheat the waffle iron. Bake waffles according to your manufacturer's instructions. I bake mine a bit hotter than the medium setting to account for the extra moisture, and I am using a Cuisinart waffle iron. Transfer waffles onto a cooling rack to firm up for a minute before serving. We ate the whole batch in one sitting so I don't know how well these waffles reheat. Peaches and pecans do indeed go very well together and I would never turn down a waffle. This past week I watched Ave try local strawberries for the first time, along with kale chips and (not so local) cherries. She really liked the fruit and it made me happy.